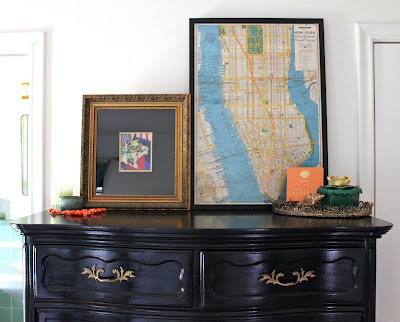 Last week Jenny at Little Green Notebook posted a room tour put together by Jenna from JWK Style, a fellow renter who doesn't let renting cramp her style! I contacted Jenna to see if I could feature her space in my "Loving Your Rental series" and she happily obliged! Would you believe she dyed the drapes with RIT dye? 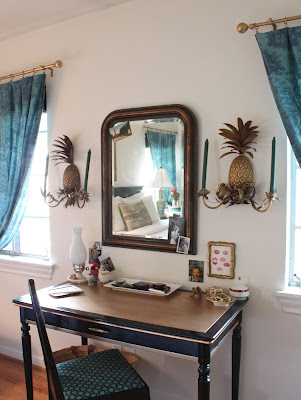 Here she used a desk she bought from a hotel liquidator which she gold leafed. Jenna told me that renting has been a blessing in disguise because it has forced her to be creative. I couldn't agree more! 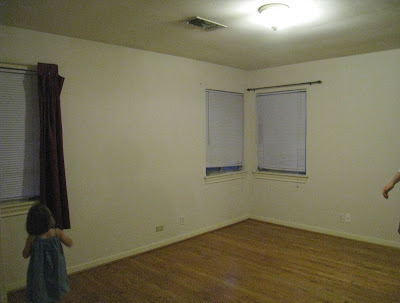 You can check out other rooms in her house on her blog JWK Style. 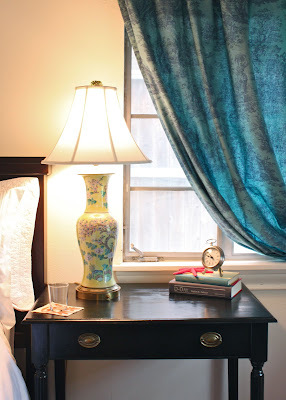 I love this space - So many beautiful ideas! 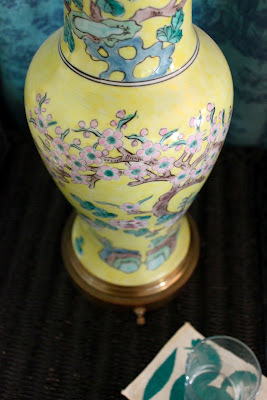 oh so much vintage & creative goodness! I agree.....making do with what you have forces you to think outside the box for sure. The curtains are brilliant. Thanks for sharing. I love pulling out ideas when there are constraints involved! I love seeing "Before and Afters" that make me go back and see them again and compare. This one is great, especially because it's a rental. She has done a wonderful job! You would never know this is the same space! I totally agree that renting forces creativity, both in aesthetics, and in keeping costs down on what you buy for the space. We've used the same drapes in our bedroom now for 3 different homes, but this time around I lengthened the drapes by sewing inset panels. The temptation would be to buy new drapes to fit the room, but instead I changed up our existing drapes and the room fit them! Thanks for the feature Barbara!! I can't believe those drapes!!! Amazing. Love before and afters. Off to check out JWK. I saw her place last week and loved it. Gorgeous pieces and they match so well together. I know too well the joys and challenges of renting. That is amazing!! very creative! 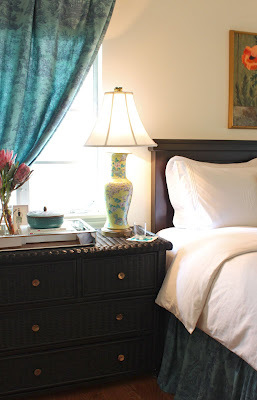 Jenna has a terrific sense of style; love the colonial feel of her bedroom! A creative and fun mix! $100 Ikea Gift Card Winner!